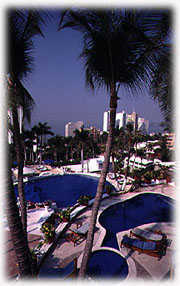 Acapulco. The name is almost synonymous with the stars of Hollywood’s heydays: Elizabeth Taylor, Lana Turner, Rita Hayworth, Debbie Reynolds, Eddie Fisher, Elvis Presley, Frank Sinatra. Acapulco may have changed since its days as an exclusive Hollywood getaway, but at Villa Vera Hotel Spa and Racquet Club, the legend lives on. This hillside retreat has regained its glamour status following a $2 million renovation of its 69 unique accommodations. Today the boutique hotel serves as a getaway for stellar travelers (Farrah Fawcett always asks for the presidential suite and Julio Iglesias has a private home on the hotel grounds) and any couple looking for peace, quiet, and privacy. The resort offers guest rooms and junior suites but it is perhaps best known for its villas named for its most famous guests. Luxuriate during your stay in the privacy of the Lana Turner Villa (where the star lived for five years), the Rita Hayworth Villa or the Elizabeth Taylor Villa, where the violet-eyed movie icon vacationed yearly for nearly two decades. Villas have private swimming pools, outdoor bars and hydromassage tubs. Many rooms have tubs perfect for a soak –a deux–complete with a sea of bath bubbles. Lovers luxuriate in “Romance,” a fragrance specially designed for Villa Vera. The hotel has also designed essential oils for its customers, a light, fruity aroma designed to trigger memories long after a vacationer returns home. The memorable oil is only one of the amenities offered by the resort’s new spa, considered by many to be the finest in Acapulco. Opened in December 1999, the spa was designed for quiet, luxurious pampering ranging from massage to wraps and facials. Special treatments include oxygenating facials designed to bring oxygen to the skin and delay the aging process, anti-stress massages, thermal mud wrap, and shower massage, a combination of relaxing manual massage and water pressure. The resort also offers a signature treatment–the Villa Vera Cocktail. This exclusive treatment combines mud, paraffin, and seaweed into a warm body wrap while the head and neck receive an aromatic essential oil massage. The spa is also adding treatments of special interest to romantic travelers. Couples will be able to learn massage techniques on each other, using edible oils. 800-327-1847 FREE. Spa treatments can be booked by guests at other Acapulco resorts.